Three DPNs and a cardboard box: this kate is the laziest of kates. Well, despite the fine craftsmanship and minutes of work that went into it, this kate has not held up well. 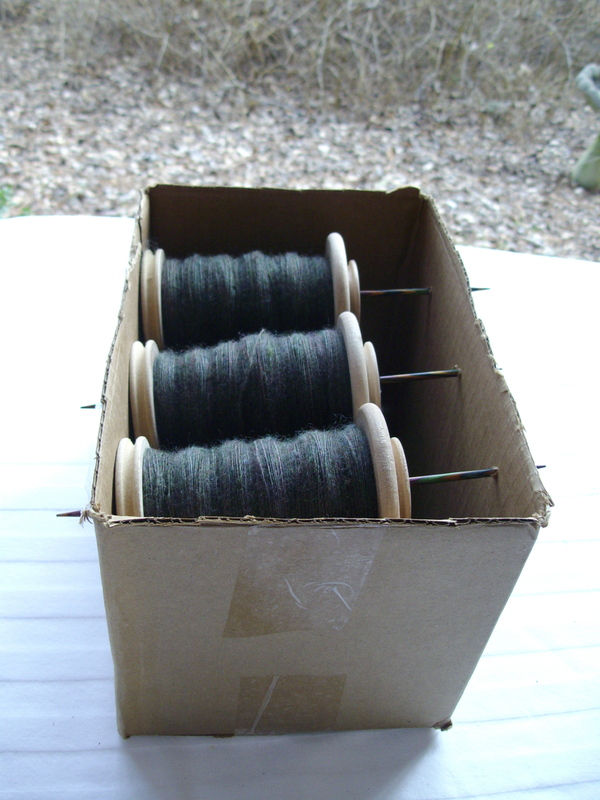 The precision holes for the DPNs have grown loose, so the needles slip out of the box mid-plying, sending the bobbins thumping to the bottom. 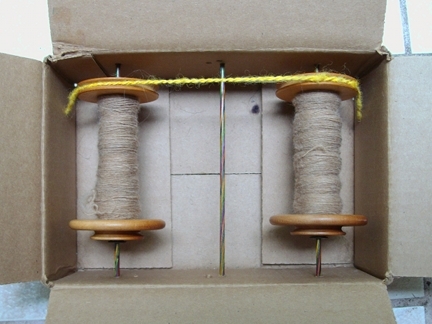 The tensioning cord (some early handspun I had lying around) rarely stays in the bobbin groove thingies, and even when it does stay there, it doesn’t apply tension evenly to all the bobbins. The kate itself lacks substance, and won’t stay put. Plying at Casa de Cusser had become a festival of tangled singles, falling bobbins, and much loud use of shocking language. It was, in sum, a whole lot of no fun. I needed a new kate. Of course, I could buy one. There are many models from which to choose, and if I buy it online, a nice person will bring it all the way to my door. However, that is not in the budget right now, and besides, I’d just finished the last singles for my first skein of Cupcake BFL/Silk (previously mentioned here), and was impatient to get that sucker plied up. Fortunately, we are rich in cardboard boxes ’round these parts. I set out to make a new, better lazy kate. A kate with fewer issues. A not-quite-so-lazy kate. This is where I got fancy. It looks like that last needle will need some recalibration, though. Angled needles. 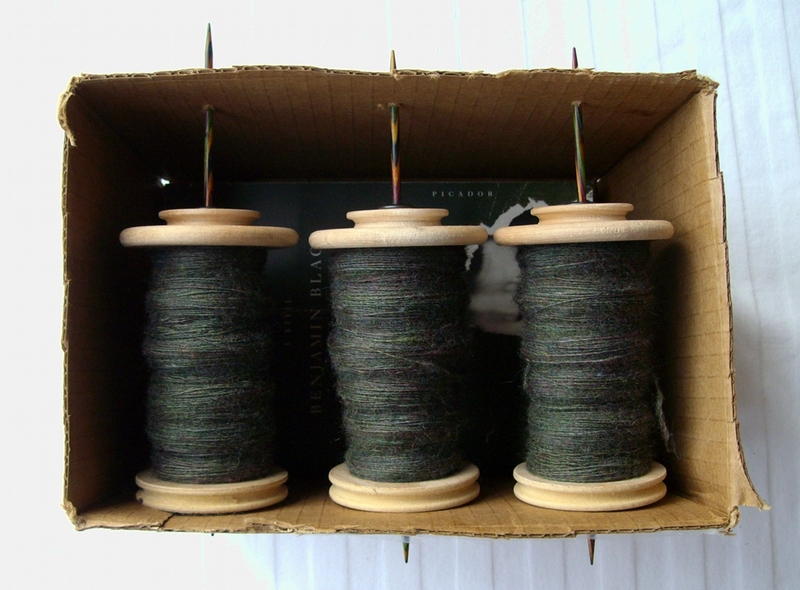 This way, the bobbins slide to one end and rest against the box, providing enough friction to keep them from spinning back on themselves. As an added refinement, since I was on a roll here, I cut the flaps off the box. Fancy, indeed. 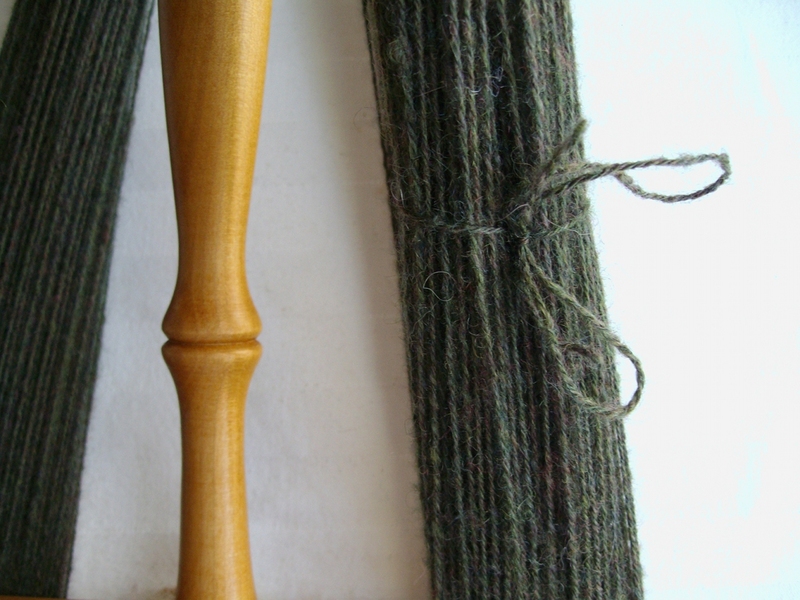 Making this yarn was such a satisfying series of Things Working As They Should. I cannot tell you how much this pleases me. From this day forward, the family must call me Cupcake Joan. 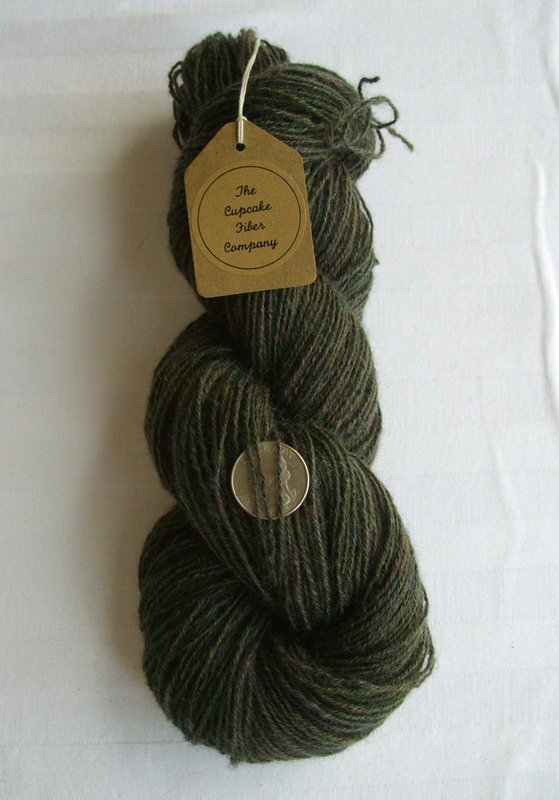 Love the yarn and your blog posts!